This section is designed to help you care for your 2CV. You will find that the front of the door will become quite, if not very, rusty. The best solution is to remove the door and place a small bead of Mastic down this vulnerable joint. However, in the short term, a small squirt of liquid grease. I am using Wurth HHS2000 and the small straw which is supplied to lubricate this area. This should be carried out every six months especially entering Autumn/Winter. You will be surprised how rusty the boot hinge and lower window grey hinge can become when not kept oiled/greased. 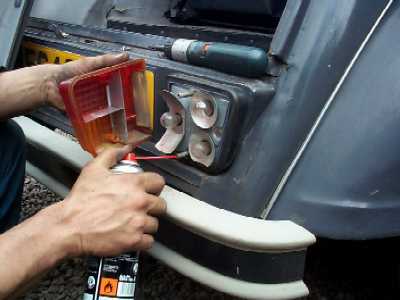 To remove the boot lid, open it so that it points at your chin, pull towards you and slide left or right. 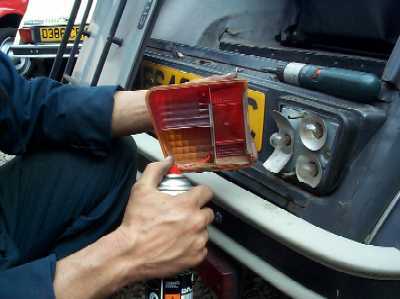 Lubricate the 'silver' double hinge heavily and put a small film of oil/grease on the grey metal. Some of you will find one of the hinges rusting and falling off. There is no remedy, just a new boot lid or new grey piece (Citroen Part Number AZ84424a). Similarly continue with your spray and liberally coat the area as seen in the photograph. 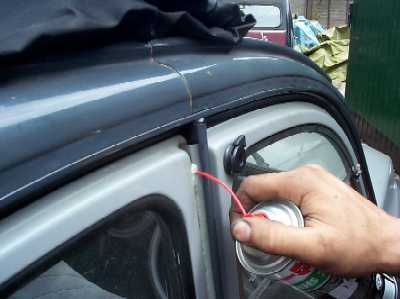 It is very important to keep the 2 front doors and boot lock well lubricated. Another tip is to always unlock the whole car and not just the driver's door. 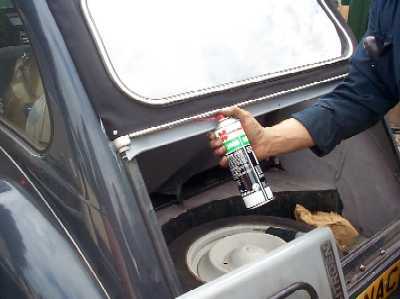 Keep the locks on the move, and lubricated, and they will not give you any problems. There is an added problem with the bootlock as it can accept rain directly into the keyhole. If your seat is not removed from your 2CV on a regular basis you will find that your seat bolts sieze up. 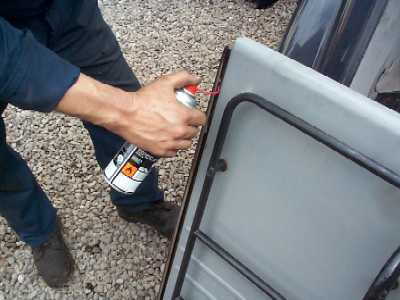 Spray them regularly and work the bolts backwards and forwards. Both these pictures are self explanatory, just a small squirt up the threaded area of the metal lamp housing and another small squirt up the plastic female tube ensuring that the Philips screw gets a good dousing of lubricant.